Abby the Librarian: #48hbc Starting Line! Yay! 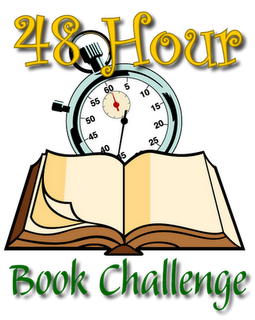 It's time to begin the 48 Hour Book Challenge! My time will officially run from 7:15pm Friday until 715pm Sunday. There's no way that either of us will read all the books on our piles, but I love to have a variety so I can pick up follow my mood when deciding what to read next. Last year I finished 5 books, so I'm hoping I can do at least that much this year. I'll be posting snippets about each book I finish and composing full reviews to post in the upcoming weeks. I'm really excited to dig into these books and hoping to get fired up about blogging this weekend, too. I look forward to reconnecting with the book blogging community and I'll be checking in with other participants and tweeting throughout. Make sure that you're following hashtag #48hbc to stay in touch!